Shattered 99 Floor Stripper - Case of 6 Qts. This industrial floor machine package is a complete package for stripping any type of commercially coated flooring. First mix your concentrated stripping solution with water in a 5 gallon bucket, then pour this solution into your solution tank. Then take one of your stripping pads and attach to the pad driver, which then goes on the bottom of your low speed floor buffer. Lastly, commence with your stripping. Refill your solution tank as needed. Some areas may need to be stripped, or scrubber twice, to help loosen your finish. Follow these steps up with the 18 gallon wet-dry vacuum to recover all stripped floor finish, as well as your stripping solution. Be sure to not overfill your wet-dry vacuum, as this will result in motor failure. When finished, it is generally considered a good idea to go over, and rinse the complete floor that you just stripped, before re-coating. Any solution left on the floor, may cause the new solution to yellow upon drying, or it may not cure properly at all, forcing you to re-strip, and re-coat your floors. 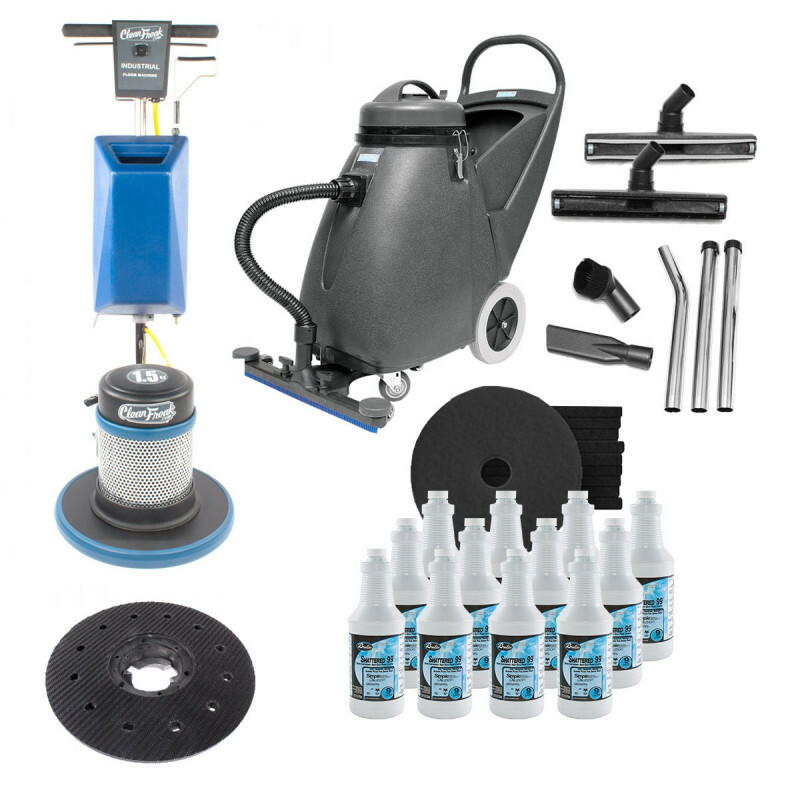 For more floor care options, please take a look at our full line of floor care package deals.